What’s not to like about this guy? Having grown up during the era of Johnny Unitas and seen the comings and goings of such greats as Joe Montana, Dan Marino, Fran Tarkenton, Terry Bradshaw and a host of others (no slight intended by the omission of all those names here; there are simply too many to list) who’ve all brought to the game and to the quarterback position a level of performance–true greatness–that served to burgeon the record books and genuinely add something to the sport, I tend to be perhaps a bit overly critical and demanding of current players. I do not try to make that popular assessment of “Best Ever” in any sport because I don’t think it’s possible to reach such a determination (with the possible exception of the Cleveland Browns’ great fullback Jim Brown—who many of us believe must’ve come from another planet, anyway…like maybe Krypton). I long ago concluded that the closest one can come in trying to determine that exalted status is to say that an athlete was the best in his time; Eli Manning didn’t play with a leather helmet (and no face mask), and Otto Graham never had to contend with Lawrence Taylor. The game has changed. The rules have changed. The equipment, training methods…everything has evolved, and it’s as unfair as it is impractical to draw comparisons that span decades and generations. Having said that, I give you Brett Favre. Personally, I was unimpressed when he broke into the NFL (as were the Atlanta Falcons, apparently—their loss). Good, to be sure—but, as someone once pointed out, “these guys were all ‘full-ride’ in school”; trying to stand out amid such a wealth of talent is a tall order, as the difference between the best and the worst is often measured in fractions of a second—with dozens more sandwiched between them. 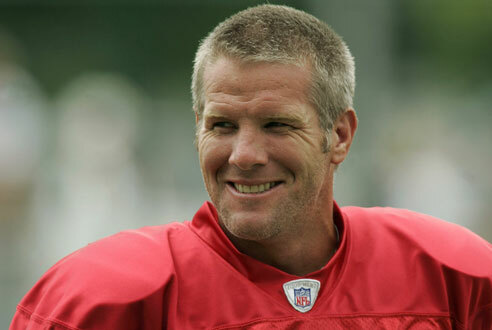 However, Favre has grown on me over the years, and I have much more respect for him now that he’s nearing the end of his career (if there is such a thing). a forty year-old QB jumping in the air, chest-bumping with linemen, and running downfield to embrace the receiver who just caught his zillionth (or so) touchdown pass with an exuberance rarely shown even by callow rookies (he already owns the record for most career touchdown passes, by the way). a forty year-old QB completing a pass, then running twenty yards downfield to throw a block (yes, a real, football-player block—not the quarterback variation thereof) for his receiver. that same QB completing a pass, then sprinting to the aid of the receiver who was injured at the end of the play—the first man to arrive. that same QB, standing on the sideline while his team’s defensive unit is on the field, being the first to go down on one knee to assist an injured player from the opposing team. …all this from a man who seems remarkably unjaded in his…what? Eighteenth season? Eightieth? Much has been said and written about the complexities involved with acquainting a quarterback with a new team’s “system” upon arrival; this guy slips into a new system like most of us put on a new suit. Business as usual. He’s that rare player who immediately makes the players around him better; the how of this dynamic defies explanation—but, it’s there. You can feel it. We’ve suffered with Brett Favre through a litany of personal tribulations including pain-killer addiction and rehab, his wife’s bout with cancer, and the death of his father (who can forget that Monday night game?). Ever the gamer, he’s thrilled us all so many times that we’ve long since lost count of the dramatic comebacks; we now take note only of those rare occasions when he doesn’t pull a rabbit from his helmet. We’ve watched him bare his soul in his retirement announcements (secretly knowing, of course, that he’d be back; there’s still too much football left in him, too much fire in the belly—and a genuine love of the game. No “quit” in this man.). We’ve watched a consummate competitor immerse himself in charity work with the same zeal he brings to the stadium. We’ve watched him take bone-jarring hits, then pick himself up and keep going as if nothing had happened—and he’s never missed a start since first taking over the position in Green Bay in 1992 (another of his many NFL records). No one will openly rejoice more at his eventual retirement, of course, than devoted Packer fans; they’ve been schizo ever since he left, painfully dividing their loyalties—especially now that he’s wearing that purple jersey that they think just doesn’t look right on him, anyway. As noted above, I wasn’t impressed at the start of his career. I am now. So are many others. Even fans who don’t much care for the Packers, despise the Jets, and couldn’t care less about the Vikings keep tabs on him every Sunday afternoon. Probably the last aging QB to enjoy such universal adulation was George Blanda—and that was mostly because he made legions of middle-age couch potatoes feel good. We admire Favre’s hard work and passion—regardless of who he’s playing for. To win through actions respect from those who don’t give it freely is a major achievement; it speaks to the measure of the man. He was never fawned-over by college recruiters, and wasn’t taken in the NFL draft until the second round. Nothing was ever handed to him; he earned it. No one questions his greatness, anymore. Long after his playing days are over, we’ll remember him not just for the records, but for that special something that he brought to the game. This entry was posted on November 19, 2009 at 4:10 PM	and is filed under favre, NFL. You can follow any responses to this entry through the RSS 2.0 feed. You can leave a response, or trackback from your own site. My only comment is, Damn Right!!! I’ve always been partial to Joe Montana.